A new story offers a look at how employees of the U.S. government are making major tech changes, trading BlackBerries for iPhones, and laptops for Apple's iPad. The new devices are "invading" the federal government, according to a feature in The Washington Post. The story kicks off by painting the picture of a special agent with the Bureau of Alcohol, Tobacco, Firearms and Explosives tracking a "bad guy" with video surveillance via an iPad. "This is not a movie. This is not a Steve Jobs dream," author Michael S. Rosenwald wrote. "This is the federal government 2.0, where technology upgrades no longer come at a 'Little House on the Prairie' pace. 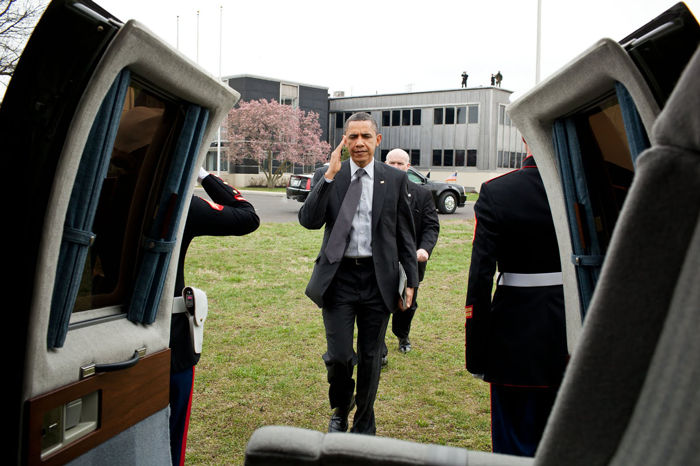 Even President Obama, a BlackBerry devotee, has upgraded. He now owns an iPad, and it has been seen on his desk and under his arm." Shifting to consumer-oriented technology like Apple's products allows the government to have happier, more productive employees. And Apple isn't the only beneficiary of the changes: Some free services, like Google's Gmail, are being adopted to cut costs, as well as offer more flexibility. ATF is said to have about 50 iPads or iPhones in use —a number expected to increase to 100 "soon." And the U.S. State Department is testing the iPad, while Congress allows the use of iPads and iPhones on the house floor. The Post also noted that the Department of Veteran Affairs will soon allow clinicians to choose an iPad or iPhone for work instead of a BlackBerry. The report characterized the adoption of Apple devices, as well as those running the Google Android operating system, as "trouble" for Research in Motion and its BlackBerry platform. President Obama shown with an iPad 2. Photo via The White House. BlackBerry devices have long been a mainstay of the U.S. government, largely because of the service's secure e-mail platform. But RIM fell behind in third-party software support, as the number of applications on Apple's App Store and Google's Android Market have continued to swell. The report also noted that RIM was "late to the booming tablet market" with the debut of its PlayBook in April to lukewarm reviews. The story from Washington is yet another bit of bad news for RIM, as another high-profile national story this week from Reuters noted that some investors have called for a change in leadership at the Canadian smartphone maker. RIM has lost market share and fallen behind both Apple and Google, resulting in a sinking stock and pressure on co-CEOs Mike Lazaridis and Jim Balsillie. As RIM struggles in government, Apple has found success across its product lineup, extending beyond both the iPhone and iPad. Earlier this month, it was revealed that Apple's sales of Mac computers to governments increased 155.6 percent in the March 2011 quarter. That well exceeded the PC market's 2.3 percent overall growth.